That's the question I so often ask myself when it comes to this little space here on the Internet. Most often the answer is, not to do. My own perfectionist tendencies hold me back. "The photos aren't good enough." I tell myself - or, "There's no story to tell." But when it comes down to it, isn't life made up of a big, messy series of imperfect events? In fact it's within the imperfections that magic happens. It was in the meatballs that I threw together on a Monday night when the house was full of chaotic clamor - children fighting, dogs barking, and the neighbors chickens had gotten loose and were running around our yard. I'd spent an hour trying to catch them all and propel them back over the fence. So dinner was late, but when we all sat down at the table a sudden peace fell over us. Like magic. The kids were calm, the dog waited quietly under the table. It was in the cookies I baked one night to bring a little happiness when Eve had a rough day at school. When she opened her lunchbox she found a smiling chocolate face looking back at her. The chocolate was smeared, the eyes uneven. Not photo-worthy, but if everything were perfect there would be no room for magic. The perfectionist in me has left this space here on Pure & Peanut Free sorely neglected lately. My last post was in August. August! But the blog is always on my mind. In fact, if you could see the list of unfinished & never published blog posts you'd realize the degree to which my perfectionism extends. They're everyday moments, recorded in time but lacking that certain something that compels me to hit the "publish" button. It's in these everyday moments that you can find magic, I just haven't been looking hard enough. If you follow me on Instagram you know that I'm never far from the kitchen! I've had many request for the recipes that I've posted over there that it seems a shame to not share them somewhere. So last week I spent some time brainstorming on how to keep this space alive, fresh and vibrant in the limited amount of time I have. It seems only right, after all this blog was my first love. So I've decided that a shift in the way these posts are formatted is in order, leaving room for a "how-to" series, for those recipes that may not have an amazing back story, but are in and of themselves, fabulous. I'll throw in a longer post here & there, too. But there's no reason why a great recipe shouldn't be shared just because I don't have a story to go with it, no? Oh, and I'll try to let go of some of those perfectionist tendencies while I'm at it. You don't mind, do you? 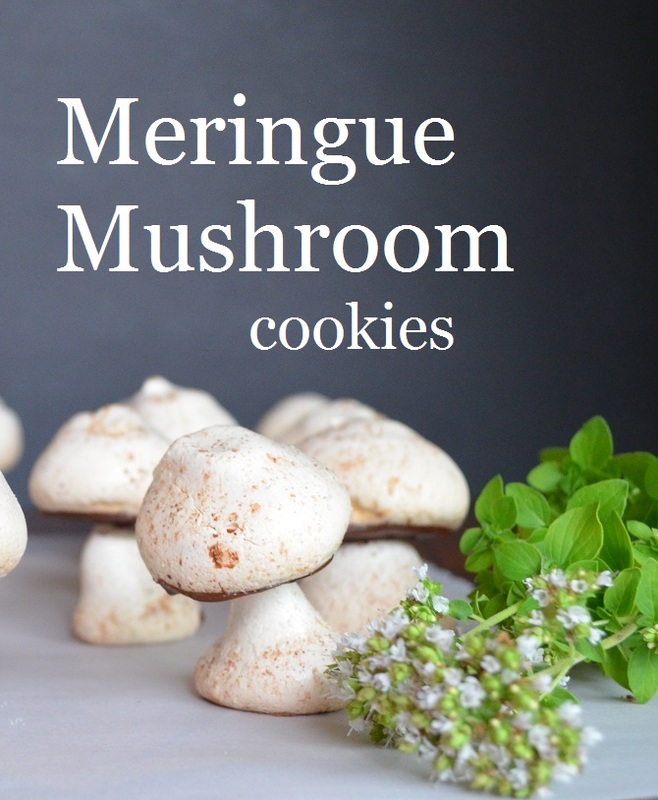 So, without further ado, here's the first in that series: How to make meringue mushrooms. 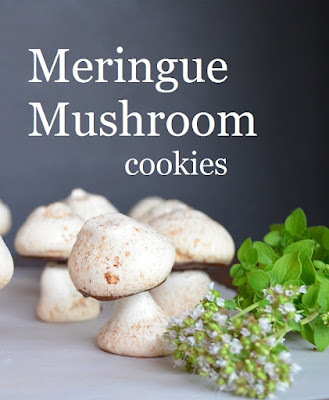 And speaking of magic, these little mushroom cookies are absolutely enchanting! They look just like the real thing - dirt and all! 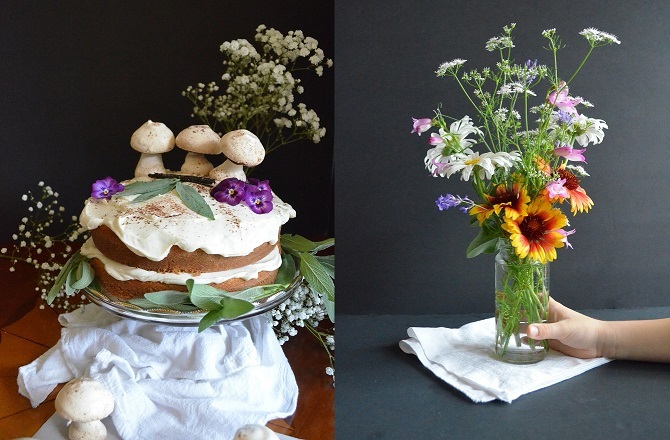 I'd been dreaming of making a forest themed cake for a while, in my imagination I decorated it with all sorts of lovely edible flowers & trailing, lacy herbs. And since meringue cookies are my favorite, I decided that my birthday was just the right time to combine both. I used my basic vanilla cake recipe and made a simple vanilla bean butter cream frosting. But when I added these cookies the magic started to happen! 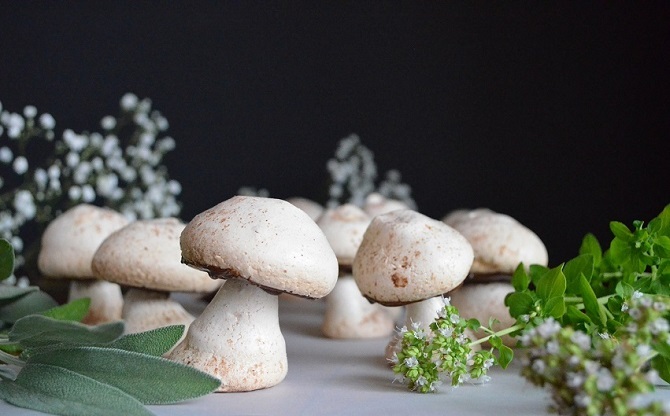 As we were putting it together it was like the forest floor magically appeared on the kitchen table - herbs and flowers picked fresh from the garden and the these mushrooms, strewn across a piece of parchment paper. All meringue cookie recipes follow one simple rule: 1/4 cup of sugar to each egg white. Less sugar and the meringues won't have that crispy exterior or hold their shape while in the oven. I used nut-free chocolate chips to glue the caps to the stems. Traditionally, these are used to garnish the yule log at Christmastime. We like to eat them just like cookies! Line two sheet pans with parchment paper. Preheat your oven to 250 F (120 C). In a large bowl with an electric mixer, beat the egg whites, cream of tarter, salt and vanilla until soft peaks form. While the mixer is running, slowly adding in the sugar, one tablespoon at a time. Beat until the peaks are firm and glossy. Place the meringue in a pastry bag fitted with a round tip - or alternately, snip the corner off of a gallon size zip-top bag and place the meringue inside. Pipe the mushroom caps onto one of the parchment lined sheets by holding the piping bag slightly above the sheet and piping the meringue into a round cap shape. Pull the bag away to the side. If there is a tip on the top of your cap, gently press it down with a wet finger. On the other baking sheet, make the stems by placing the bag directly on the sheet pan and piping out a disk of the meringue. Then pull the bag straight up to make a Hershey kiss-type shape. Lightly dust the caps and stems with cocoa powder and use a folder or a folded newspaper to gently fan off the excess. Place the sheets in a preheated oven and bake for 1 hour. Turn the oven off and crack the door, but leave the meringues in there for another 15 minutes. Melt the chocolate in a double boiler or in the microwave. With a toothpick, gently hollow out a hole in the bottom of one of the mushroom caps. Spread the bottom with melted chocolate, being sure to fill in the hole. Place the tip of the stem in the hole and allow the chocolate to solidify completely.